I suppose that I'm an anomaly among-st musicians, I don't know, but I'm always trying to see the deeper message within a song. It's not good enough that a song should sound good or have good rhyming lyrics. If a tune is going to embed itself into my heart there has to be meat on it's bones, a message deep within, a little bit more than just 'listen to me, I'm catchy!'. Sometimes that message seems obvious and sometimes it isn't all that clear. Sometimes you have to spend a little time listening over and over to figure out what it is telling you. As I come to the closing sets of my life, I find these messages are even more important to me, these little pearls of wisdom acquired through hardships and experience, help me gather the strength and courage to face my own demons and stand tall when the world seems to turn upon me. Weird huh? None the less, that's how it's been for me from the start and as I find myself approaching the crossroads of life I have yet to figure just what I will do when I get there. All I know is that they are with-in sight and I am still in need of guidance. Life can be a scary thing if you pause, long enough to think about it. Still, without fear, where would the thrill be found in life? Without those messages, hidden within, what would be the point of a song. Feed Jake, written by 'Danny "Bear" Mayo', is just such a song. It has those, seemingly, redneck lyrics but the message to me is very deep and thoughtful. We walk through life like the living dead, seeing and yet not seeing. We know what is right, but often it seems easier to let things pass as they are rather than trying to make things right. We judge others for those things which we would not have ourselves judged by. This song speaks to me of these things. That in it self is no great thing, if it can not stir my heart into action. Somehow, however, it reminds me of my failings and prods me to do better, so in that it has succeeded. This is what a song must be able do if it is to become a great song. There are plenty of good songs out there that are, no doubt, catchier but a GREAT song reaches out an touches your heart. 'Feed Jake' does that. 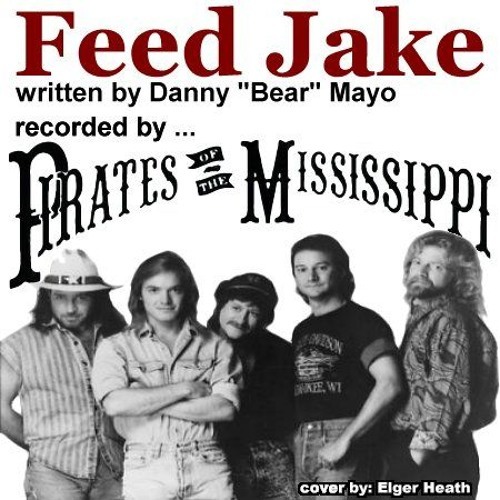 Released in 1991 by the band Pirates of the Mississippi is 'Feed Jake' was the first piece of music that brought this band to my attention. It was a great hit and my battered old hands can't do it the kind of justice it deserves but, if you haven't heard this tune yet, check out this simple cover and then check out the original artists to get a taste of how they did it.